I really don’t understand ‘Underworld Tubeophany’ as an opening track. 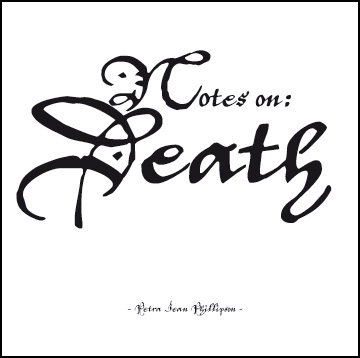 Just putting out there, right away, so I don’t have to dwell too much on this thirteen-minute outing that diverts us from the stellar voice of Petra Jean Phillipson, on her theatrical folk-influenced album ‘Notes On: Death’. Coming across like a secret Siouxsie Sioux or PJ Harvey in the vocal department, although instrumentally the album is patchy, her singing talent and ability to put together a startlingly attention-grabbing song. ‘City Of Lost Angels’ quite simply floored me after the endlessness of aforementioned opening track. Out of nowhere, we suddenly get smacked with a pitchblack, disorted, sultry song that sounds like a lost Siouxsie & The Banshees single circa ’Juju’, or a heavier track from Siouxsie’s ‘Mantaray’. It really is that good. Slow-burning, with calculated rumbling bassy guitars and apocalyptic cymbals crashing over operatic notes. With little warning, this segues into the bleak, no less ominous, and holds a surreal folk/jazz hybrid style at its heart that propels Phillipson’s voice to the fore as a velvety, breathy yet intense entity with a great tunefulness as well as an evocative style of expression. The instrumentation remains strong too, with a sinister acoustic guitar, hushed drumkit and strings that rise and fall with grace and aplomb. Grace and aplomb might also best sum up the understated acoustic intensity ‘My Love Resides In The Garden’, a song that sidles up to folk with a rather unnecessary birdsong track that unfortunately gets in the way of what is otherwise another quietly powerful song. ‘Kill You Drink You’ is a genuinely unnerving anti-lullaby/anti-serenade for a cold January night too, the kind of menacing song Nick Cave’s long-lost twin sister might write after being jilted by a fairy king. The purring ‘And Lilith Said Unto Adam’ holds a similar effect, combining elements of English folk, blues, and the more esoteric nooks of post-punk in its quest to create a romantic yet undeniably sinister song that entices the listener with gently strummed guitar and a fluid melody but chills then with ethereal backing vocals and a chiming like icicles caressing the soul. ‘All At Sea’ is one of the most esoteric moments, a post-punk styled folk song driven by a passion rarely seen in the flaccid indie-folk of today. Not all of it works. ‘You Asked For It’, despite a hot-blooded and passionately discordant Johnny Thunders style delivery full of distortion and bile to coat the mysticisms, doesn’t click all the way. On the polar opposite of awkwardness is the overly-syrupy ‘Victorian Worship Song’ which lilts its harp-driven course perhaps a little too long, even if Phillipson’s voice is on fine gossamer-gentle form. ‘Dark Nights Of The Soul’, while also a little heavy on the sentiment, tempers the syrup with eerie vocal interplay, clashing percussion, and a more concise length. I would say that this album is possibly not destined to hit the giddy heights of Siouxsie or Havey. It’s more a collection of songs than anything, with instrumentation that ranges from excellent to indifferent. But the be-all and end-all of the album, the absolute centre of its universe, is Petra Jean Phillipson’s voice. And let me tell you: that is a thing of great beauty to listen to and enjoy.